Know your Walther P38. Hoffschmidt. Covers models P.P., P.P.K., K.P.K., P.P. Super; T.P.H., and copies. Includes chapters on history, catalog sheets, development, wartime production, postwar German and French production, markings and numbers by period, experimental pistols, 4mm conversion units, operation, magazines, ammunition, and more. Illustrated with photographs of each weapon and exploded view drawings (parts schematics), etc. Soft cover, 11¾ x 8¼ in., 48 pp, over 60 illust. in photos & line drawings, durable thread-sewn binding with laminated covers, 2001. ISBN 0 949749 25 7. 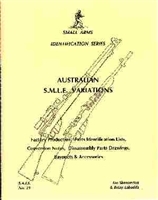 Historical & technical descriptions of limited production De Lisle silenced commando carbine models and assorted gas operated conversions of the Lee- Enfield rifle in England, New Zealand, South Africa & Australia, over forty-year time frame. This handbook is an authoritative source, by a leading weapons authority, on the most important military rifles in use in the world today. Modern Military Rifles includes makes and models from leading manufacturers and examines rifles from Germany, Russia, the USA, France, Britain, China and other major producers. Modern Military Rifles covers all significant aspects of design and employment, with data for each weapon on length, weight, barrel, magazine, muzzle velocity, cyclic rate and cartridges. Based on detailed research and familiarity with rifle models and variants, this book is an outstanding and up-to-date reference source. This volume examines one of the outstanding successes in small-arms history. From the first gun designed by a convalescing Red Army sergeant in 1941, to mass production and use by a vast number of armed forces throughout the world, this is the complete story of Kalashnikov. The prototype was developed into the AK-47 by 1949, and by the 1950s the Kalashnikov had achieved runaway success based on simplicity and reliability. This superbly illustrated gun-by-gun directory identifies individual Kalashnikov variants and types, and includes details of sights, bayonets and ammunition. Practical Markmanship. M. M. Johnson. jr. Most gun people know about Melvin Johnson from the M1941 Johnson rifle he designed with his company, Johnson Automatics, as a competitor to John Garand's more successful design. Few realized that he was also a serious marksman involved in formal competition shooting. "Target practice, properly conduced over a sufficient period of time and with correct psychological approach, is the most efficient, the most practical, and the most valuable means of creating military character, or 'Fighting Heart.' "
Johnson goes from there and give guidance for making elevation and windage corrections at unknown ranges, engaging with snap shots, against moving targets, and gunnery with machine guns. Overall, this is a fairly complete, yet concise, book on field shooting I've read to date. Loading the Peacemaker. Colt's Model P. Scovill. History of the Colt Model P Peacemaker. Describes the loading procedures and accessory equipment for loading and using the Peacemaker. ammo, & takedown info. , 80 pgs. Soft cover, 11¾ x 8¼ in., 48 pp, over 60 illust. ; photos, assembly & pattern drawings, durable stitched binding & plastic laminated covers, 2001. ISBN 0 949749 42 7. Lewis ground and aircraft gun variants in Briti sh Empire service along with references to its US counterpart manufactured by Savage. The service details, maintenance & stripping, accessories & spares are described in this classic reference. This authoritative guide to post-war machine-guns covers a vast array of weapons from the Gatling gun to the six-barrel Vulcan. In addition to outlining the history of each weapon type and its development, this guide cites the caliber, ammunition, length, weight, feed, rate of fire, and muzzle velocity of each weapon. Includes weapons manufactured in Britain, the US, Germany, Russia, Yugoslavia, China, Italy, Israel and Czechoslovakia. TREATISE ON AMMUNITION - 1887’ H.M.S.O. Hard cover, 480 pp, 180 illust. with 9 additional full-colour plates plus fold-out charts. 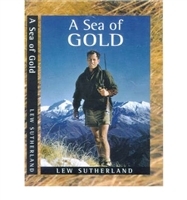 Facsimile reprint 1999, with dust jacket. Very well-detailed and fully indexed treatise on British service small arms ammunition, gun ammunition, rockets, powder, charges, fuses, shot & projectiles. Especially for 19th century artillery enthusiasts, this would have to be the ultimate reference for ammunition of the period. Traces the Manhattan background from its formation in 1855 to its succession by the American Standard Tool Company in 1869. A serious work on an American maker; merits a place on the bookshelf of every arms collector & enthusiast. 65 B&W photos by noted collector Miles W. Standish;, 256 pgs. Manhattan’s activities spanned the years 1855 to 1873--an exciting period in American firearms that witnessed the high development of the percussion revolver, its rapid decline in the post–Civil War years, and the emergence of metallic cartridge arms. Substantiated by original records, the author discusses Manhattan’s four patents, the connection of the Manhattan .22 caliber revolvers with the early usage of the .22 long cartridges, a lawsuit between Smith & Wesson and Herman Boker & Company, as well as many other aspects of Manhattan’s history. A serious work on an American maker, this book constitutes a significant contribution to firearms history and merits a place on the bookshelf of every arms collector and enthusiast. 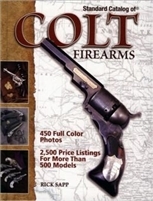 Standard Catalog of Colt Firearms contains Colt classics and cutting-edge models including Tommy guns, 1911 autos, and Monitors. Provides pricing and identification data useful when monitoring online auction sites and research online sites for the best deals. Features a foreword from Colt Manufacturing Co. Still America's oldest continually produced firearms brand, Colt may not be making as many new models as it once did, but the value of what's out there is on the rise; creating a robust market for collectors. With 500 large-format color photos of Colt firearms and modern Colt clones, certified pricing in up to five grades of condition, serial number data, and details about legendary (Tommy guns) and trendy (Anaconda and .28 Supers) models, this one-of-a-kind reference helps you identify arms, and inspires your appreciations of Colt. Australia's S.M.L.E. Variations. #19. Skennerton. Soft cover, 11¾ x 8¼ in., 48 pp, 75+ illust. ; photos, assembly & armourers drawings. Stitched binding, plastic coated cover, 2004. ISBN 0 949749 49 4. 450 & 303 Martini Rifles and Carbines. #15. Skennerton. Soft cover, 11¾ x 8¼ in., 48 pp, over 60 illust. ; photos, assembly & pattern drawings, stitched binding, plastic laminate cover, 2002. ISBN 0 949749 44 3. Guns and gear for the battles of tomorrow...fully illustrated with photos. From the chariot to the catapult, the army with the most advanced technology rules the battlefield. Today the U.S military is working on weapons unlike any ever devised, from rifles and other devices carried by ground troops to vehicles and heavy armor. Here a foremost chronicle of military action and weapons guides readers through the most advanced armaments and equipment of today - and tomorrow. The relationship between war and science — as old as the wheel — entered a whole new realm with the Civil War, the first truly ""technological"" conflict. 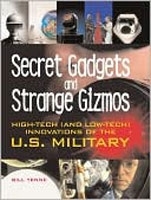 Secret Gadgets and Strange Gizmos traces this evolving connection from the deadly innovations of the Union and Confederate forces to the top secret, high-tech inventions that are making military history today. Chronicling the hits, the misses, and the important technological advances produced by the U.S. military’s high-tech hubs — aviation, wireless communication, the Internet, atomic energy, satellite technology, and space travel — this richly illustrated book takes readers from the ironclads, land mines, and ship-launched hydrogen balloons of the Civil War to the world-changing bombs of the Atomic Age. Second Hand Hardcover, owners name inside, Ex Cond. A hard to find book. This superb reference book identifies 1080 revolvers and 1320 pistols and is an indispensable to twentieth-century handguns. More than 2600 individual drawings, all of the highest standards of draftsmanship, give comprehensive coverage and make this book both unique and exceptional. STORIES FROM THE COLT'S GAME STORY CONTEST. Secondhand, 1ST Edn G Cond, small bump to spine. Red cloth binding with grey spine covering. Picture displayed is of a current copy. It is now more than 100 years since Elmer Keith developed a keen interest in handguns. As the decades became a part of the past, Elmer Keith was recognized as a great shot on the range and in the field and the leading pistol and revolver authority in the land. It is very likely that he burned more gunpowder than any man living today. Extensive experiments were conducted in arms design and with ammunition. His bullets and loads, the result of these efforts, are still in common use today. Many friends, not the least of whom was Judge Don Martin of Salmon, Idaho, prevailed upon Elmer Keith to produce a major opus sharing his vast knowledge of handguns and shooting techniques. Sixguns is the answer to this demand. Secondhand. Fair to good cond. Dustcover with small tears and smudged.Fly slightly seperating at spine. Water marks to top corner of middle 1/3rd of the book. "Memoirs of the bronc rider who became a world-famous big-game guide and the dean of American firearms authorities." Chapters include:- Mostly Missouri (1899-1911); Growing up in Montana (1911-1917); Packing out of Helena (1919-1923); Camp Perry, Idaho and Oregon (1924-1927); My first British Columbia hunt (1927); Oregon to Idaho (1927-1931); Hunting in Mexico and Alaska (1932-1937); Canada and Alaska again (1937-1939); The War years and after (1940-1957); My first African safari (1957); Experiences hot and cold (1958-1967); My last African safari (1968-1969); Afterthoughts, conclusions and postscripts. 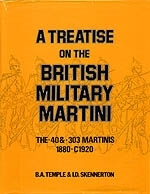 "A Treatise On The British Military Martini, Vol.1" by Barry Temple & Ian Skennerton. The first volume in the series covers the development , trials and acceptance of the Martini-Henry into British Service. 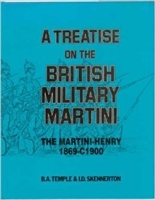 Treatise on the British Military Martini.1880 -C1920. Temple, Skennerton. 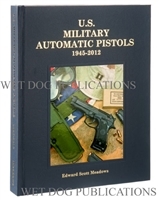 U.S. Military Automatic Pistols Volume II 1920-1945 by Edward Scott Meadows. Hardcover, 448 pages, copyright 2009. 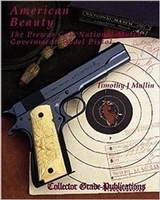 Part One Model 1911A1 Pistols chapters include: Introduction, Colt's Patent Firearms Mfg. Co., Singer Mfg. Co., Remington Rand Inc., Ithaca Gun Co., Union Switch & Signal Co., Action Photos, Part By Part Comparison, Test and Experiments, Renumbered, Rebuilt and Cutaway Pistols, Inspection Procedures, Oddities, Ammunition, Accessories and Publications. Part 2 Military .22 Pistols chapters include: Colt Ace, Colt Service Model Ace, Colt Woodsman, High Standard Model B, High Standard Model USA-HD,High Standard Models A&E. Part Three Special Purpose Pistols chapters include: Colt Model M, Colt Super .38, Colt Model N, Sheet Metal .45. US Military Automatic Pistols 1945 - 2012. Vol 111. Meadows. 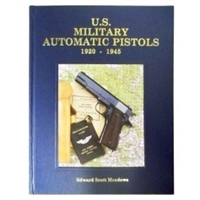 Scott's THIRD book in the U.S. Military Automatic Pistols series covering U.S. Military handguns in-use SINCE WW-2. Korea, Vietnam, Middle East conflicts. Covered is Post War use if the Model 1911/1911A1 including renumbered and rebuilt guns, specific use variations/modifications, moving into the introduction and adoption of the M9 series of 9MM handguns in 1985 - all models and configurations. Followed by sections on "special purpose" firearms, including the Colt Model M, OHS and MHS guns as well as Catron, Kimball, PDW, Gyro-Jet, etc. . Plus coverage of trainers, match guns, etc. Superbly done. Considerably larger than Vol.II (450 pages), Vol.III has 569 pages and well over 1000 high resolution photos. High quality binding and paper, high resolution photography. Similar cover to Vol. II. If you're a serious U.S. Military pistol collector - YOU NEED THIS BOOK!!! Hard cover, V G Cond, small tear to dustcover rear. Adventures of a Montana cowboy who gained world fame as a big game hunter. The dean of American gun writers, Elmer Keth tells his own story, cowboy, broncbuster, hunting guide and rancher, Keith maintained an abiding and active interest in firearms, here he takes you from Alaska to Africa on his big game hunts. Times were different then. The stock market crash of October, 1929 heralded the worst depression in American history. At the same time, one-handed target shooting was considered by many to be a very popular and highly respectable pastime. In January, 1932, Colt's introduced their hand-fitted, premium-grade National Match Government Model pistol. Eminently suited for target shooting, the National Match carried a sticker price of $40.00 in the days when a brand-new Government Model cost $21.00 or $22.00. Perhaps this is why they were made for only eight short years, and why they may well be rarer, in terms of numbers produced, than the Colt Paterson or Walker. Includes 20 spectacular color photos of factory-engraved guns and other authenticated upgrades, including double-carved ivory grips!